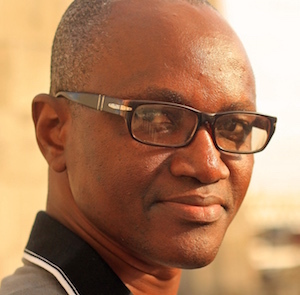 Umaru Fofana, a Sierra Leone journalist who reports for the BBC, NPR, Reuters, and local media, covered the Ebola virus epidemic. He risked his life interviewing victims and entering areas in which the virus had spread. Despite taking precautions, each day’s undertaking was harrowing, and it was simultaneously loving and tense to return home to his wife and three children. Fofana felt a duty to alert the world about the epidemic, and he worked for almost a year in dangerous circumstances. Profile: It’s not easy being a journalist. Just ask Umaru Fofana, a well-known and respected journalist in Sierra Leone who files regular radio, television, and wire reports for BBC, NPR, and Reuters, and who co-owns Politico, a local newspaper. In the fall of 1997, during Sierra Leone’s brutal civil war, Fofana was captured by a group of soldiers—or rebels, it’s not clear which. He was shot in the right leg and tortured for two days until being brought to a hospital. His courageous reporting continued after the war and he’s received death threats. But compared to what he’s been going through the last few years, all that is insignificant. Fofana has been covering the outbreak of the Ebola virus in his country and it isn’t only Fofana who’s been at risk, but his wife and three children as well. If you take precautions, Ebola is unlikely to infect you. The problem is that not everyone takes precautions, and there’s always that little slip that can spell doom for you and for the ones you love. But every day, Fofana would go out, cover the story of the disease and the epidemic, and return home. In the direst of times, Fofana and his wife kept their children in the house. School had been canceled because of the outbreak, and any venture outside the house was dangerous. The Fofanas even locked the front door when they had to leave for business or for groceries. “My kids,” he says, “were like in prison.” Whenever Fofana did go to work—for example, to interview a victim—he made sure to have plenty of antiviral gel. There were some harrowing moments. At one point, Fofana’s two-year-old daughter ran a high temperature, and it wasn’t known whether she had contracted the disease. After two hours—“the longest two hours of my life”—the temperature receded. Another time, Fofana contracted a serious abdominal pain, which is one of the symptoms of Ebola. The pain got so intense that early in the morning, Fofana’s wife drove him to a doctor. It turned out to be an ulcer. Fofana covered the Ebola situation for almost a year, virtually every day. Finally, the epidemic subsided. “Things became a lot calmer. People began shaking hands again. All those chlorine solutions that dotted offices and homes have gone,” he says. In addition, schools have reopened, and the Fofanas feel that their children are relatively safe going outside, though hand sanitizers are always at the ready.